Stay motivated and train harder when you choose a pair of sports headphones from Jabra. Designed to perform to an exceptional standard under the most strenuous conditions, you can put your trust in our range to deliver amazing sound quality in any situation. Come rain or shine, world-class sound and supreme comfort are guaranteed. Frequent gym-goer or enthusiastic cycler, thanks to the high IP waterproof rating found on all our sports headphones, you'll never need to fear damage from sweat or a sudden downpour again. Resilient and secure, you can be confident that your favourite playlist won't be disrupted - helping you to focus on being the best you can be instead. 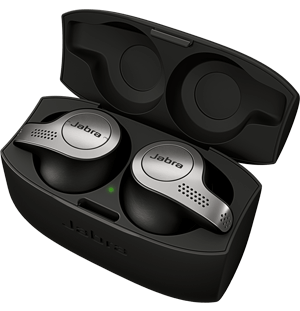 Other advanced features have been added to various Jabra sports headphones to help keep you on top form. From built-in step counts, automatic rep counts and heart rate monitors to specialised VO2 Max training, race time predictors and recovery advisors, our headphones do much more than just send music to your ears. Training to compete, working towards a specific fitness goal or practice sports as a profession? Our headphones are designed to keep up, and offer the very best technology to assist anyone who's serious about fitness. You can even plan your workouts, track the route of your previous run and enjoy in-ear coaching when you unlock the free Jabra Sport Life app. Discover the collection of Jabra sports headphones, and experience unforgettable sound-quality today. 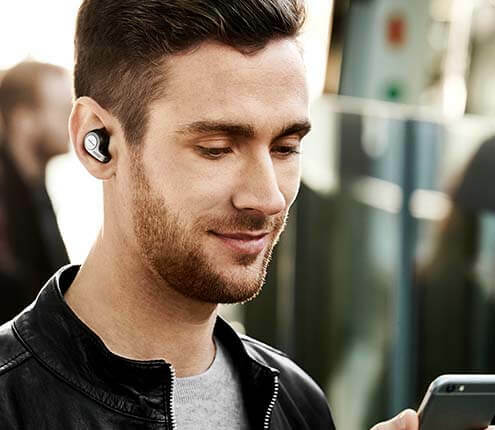 Jabra Elite Sport are the most technically advanced true wireless sports earbuds with superior sound for music and calls, featuring an IP67 rating and up to 13.5 hours charge.